2016 Conference Sessions for Monday April 11th. Reading Recovery and Classroom teachers are part of a team approach to transition students once they have completed their Reading Recovery series of lessons. Discussion will be centered around the following: using classroom and Reading Recovery data to facilitate conversations, adopting a school team approach to literacy support, developing common understandings through a common language, and bridging individual instruction with independent classroom practice. 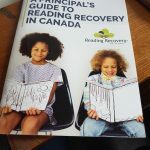 Ericka Sutherland is a Reading Recovery Teacher Leader and Early Literacy Consultant with the Halifax Regional School Board in Nova Scotia. We will explore the five essential elements that are ‘key’ to effective instruction in writing. We will demonstrate how these five keys – Conversation, Construction, Conventions, Composition and Complexity – work together to create independent, successful writers. Prepare to be pleasantly surprised. Shirley DeSouza is a Reading Recovery Teacher Leader with the Dufferin Peel Catholic District School Board. Liz Lightbound is a recently retired Teacher Leader with the Dufferin Peel Catholic School Board. Together, they have 30 years in Reading Recovery. We will explore the key understandings of Reading Recovery in depth while observing student examples of our theoretical principles in action. Christine is currently a Canadian Trainer-in-training. Her background in Reading Recovery dates back to 2002 where she trained as a Reading Recovery in Edmonton Public Schools. She went on to become a Teacher Leader in 2006 and moved to the Vancouver School Board in 2012. Next year she will take on the role of Trainer for the Mountain Pacific Region.